Can SXM Airport Develop into an Aerotropolis? Dr. John Kasarda at SXM Airport’s 70th Anniversary Symposium. (February 10, 2013) - When Prof. John Kasarda spoke, the whole hall listened. And when he had finished speaking, the awe and admiration of his audience translated into one main question: could the Princess Juliana International Airport (SXM) develop into that grand picture of an aerotropolis, which the world renowned professor had just painted? The answer would appear to have already been given by the managing director of SXM Airport, Regina LaBega in her own address at the Anniversary Symposium held in December, 2013 that kicked off the celebrations of the 70th anniversary of the Princess Juliana International Airport. 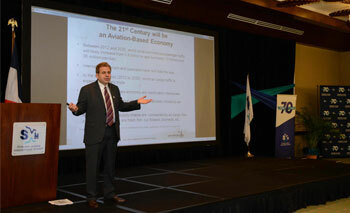 The keynote speaker at the Symposium was Prof. Kasarda, the leading proponent of the aerotropolis concept in the world. LaBega had set the stage, so to speak, by taking the audience on what she called a “short flight into the future.” It is no flight of fantasy, she stressed as she painted a picture of SXM Airport in the year 2020, which is a mere six years away. “Imagine,” she began, “that all those jet-setters bound for Anguilla and St. Barths, who normally come in about this time of the year to escape the cold and bask in the warmth of the Caribbean sun, park their Citation, Lear and other private aircrafts at the present location of the Met Office, which by now has been moved closer to the ATS Tower with which it shares a natural synergy. A new ultra-modern FBO facility will be erected here. “Imagine that as a result of close cooperation with our Justice Ministry and the relevant authorities in Anguilla and St. Barths, these passengers are processed quickly through Immigration, with a pre-clearance for those hub partners. They then come out of SXM Terminal Building, and jump on a yacht or boat that will take them in a short smooth sailing to those destinations where they no longer have to go through the hassle of another immigration check. For visitors bound for the northern half of the island, she suggested that they would be “ferried to their hotels or private accommodation without having to endure any rush hour traffic on our roads,” that is, if they choose not to drive on the new Causeway. Indeed, for Prof. Kasarda, airports serve as a “calling card” for a country. “Airports serve markets, not only airlines. Airports also serve their whole islands, not only travelers,” he said. Speed, Prof. Kasarda stressed, has become an “economic weapon.” “It’s the fast that are leading the slow, not necessarily the big, (in other words, the economies of scale), leading the small,” he added. Prof. Kasarda minced no words in identifying the one factor that he said was imperative for the success of developing an airport city or aerotropolis: a committee or task force with a visionary leader at the helm. However, he warned that “vision without action is a daydream, but action without vision is a nightmare.” He expressed confidence that the management of SXM Airport was on the right path and reiterated in response to questions from the audience that size was not necessarily an impediment, while speed in decision-making and action is a sure way to success. Smaller airports have been adopting and adapting the aerotropolis model, Prof. Kasarda said. Even airports that have space limitations, he continued, are developing in the direction of a structure that looks more like an airport city or aerotropolis. Airports in Asia, the Middle East and Europe have been rapidly transforming themselves into airport cities. Singapore (SIN) is a prime example in Asia, with Schiphol in Amsterdam (AMS), Charles de Gaulle (CDG) in Paris and Frankfurt (FRA) in Germany as the models in Europe. US Airports (and almost by extension, those in the Caribbean) are quite behind where this concept is concerned. These airports, particularly Schiphol and Charles de Gaulle, are run on a private-public sector partnership and are usually devoid of political interference. They have organizations like the Schiphol Group, Fraport or Aeroports de France that basically do business like private sector companies do, not the way governments do business. However, coordination between all stakeholders is central to the successful development of an airport city, Prof. Kasarda stressed. The driving force behind the aerotropolis model is the route structure; in other words, connectivity. Airports with more connectivity that is, the number of markets/destinations they serve multiplied by the frequency of service to those markets, will obviously attract more aviation-related business to the airports than those with less connectivity. In this scenario, however, enhancing the passenger experience is fundamental as it would not only lead to increased revenues but also it could attract even more passengers. Kasarda suggested that hub airports should improve their status by reducing costs for airlines that service them and focusing on increasing non-aeronautical revenue sources. The time may come, he said, when rather than airlines paying landing fees, it would be the airports that would pay the airlines for bringing passengers to them. Prof. Kasarda’s lecture was held under the theme: ‘Leveraging your airport for non-aeronautical revenue and economic development.” The lecture series will soon continue with other guest speakers addressing various themes as SXM Airport celebrates its 70th anniversary.